A cable stripper designed to strip various types of cables being used in the networking world of voice, data and video. 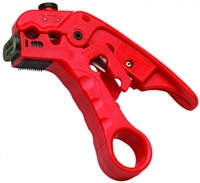 The "Big Red" is an easy-to-use professional cable and wire stripper/cutter for most cable types/sizes in the networking world of voice, data and video. Platinum Tools ProStrip 25R Cable Stripper. Designed to meet the demanding expectations of professionals. These wire strippers deliver performance, comfort and consistent, reliable results. The tools can be used left or right-handed; wire sizes are marked on both sides. Ergonomically designed handles require less hand force and curved cutting blades ensure cleaner, precise cuts.